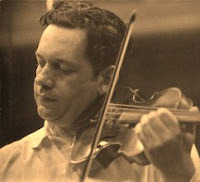 Arthur Grumiaux was a Belgian violinist, teacher, and pianist (in the style of Julia Fischer) born on March 21, 1921 (Heifetz was 20 years old.) He began violin studies when he was 4 years old. As a very young student, he studied at both the Charleroi Conservatory and the Royal Conservatory in Brussels (where Alfred Dubois was his teacher.) He also studied composition with George Enesco (in Paris) later on, though I am not certain whether he studied violin with him. It is quite likely. He won the Vieuxtemps Prize in 1939. It has been said that after his public debut with the Brussels Philharmonic in 1940 (playing Mendelssohn’s e minor concerto), he did not play publicly until 1945, the year in which he made his debut in London with the BBC Symphony. This interval of non-participation in public performances was due to the German occupation of his neutral country during World War Two. However, he did play chamber music privately during this time. He was appointed professor of violin at the Royal Conservatory in 1949. By then, he had established himself as one of the world’s great violinists. His first tour of the U.S. came in 1951. He is remembered for his partnership (and recordings) with pianist Clara Haskil, who was also a violinist (as Grumiaux was a pianist.) Sometimes, Haskil and Grumiaux were known to switch instruments in recitals. It is probably true that their Mozart (and possibly Beethoven) recordings have never been excelled by anyone. Grumiaux’ recording of Zigeunerweisen (Sarasate) is my personal favorite. His recordings for the Philips label covered a wide range of violin repertory. There is at least one recording (of a Brahms and Mozart sonata) in which he plays both the violin and the piano accompaniment. His playing has often been described as supremely refined and elegant and his technique as exquisitely effortless. His intonation was impeccable. A recording of Arthur Grumiaux playing JS Bach’s Gavotte and Rondo from the Partita No. 3 in E major for unaccompanied violin is included on the Voyager Golden Record attached to the Voyager spacecraft. As Menuhin was made a Lord in Britain, Grumiaux was made a Baron in Belgium (1973.) He played a J.B. Guadagnini violin made in 1773 previously owned by Aldredo Campoli and subsequently (after 1962) played by Joseph Silverstein, now in the hands of the concertmaster of the Washington National Symphony. He also played a Guarneri from the year 1744 which was certified by the notorious violin dealer Dietmar Machold. There are numerous videos of his playing on YouTube and he also has a fan page on Facebook. Grumiaux died unexpectedly on October 16, 1986.